set the theme of your campaign, what would you say? There will be a one hour guided walk beginning at 11:00 a.m. followed by lunch in a picnic area. Members interested in going should plan to get to Wave Hill by 10:30 in order to have time to assemble and divide up for the walks. Since parking is limited carpooling is advised. Members able to drive others or wanting to ride with others will meet at an area (to be determined) by 9:30. A signup form will be mailed to members in April. A serene oasis overlooking the Hudson River and Palisades, Wave Hill is a 28-acre public garden and cultural center. Enjoy year-round programs in horticulture, education and the arts, including our popular Family Art Project, provided free with admission every weekend. Relax in our spectacular gardens, often called “one of the greatest living works of art.” Have a light meal in the Wave Hill Café, take in the contemporary art exhibitions in Glyndor Gallery and our music season in majestic Armor Hall. And don’t leave without a visit to The Shop at Wave Hill. Note: To print the form — (on Mac Control-Click/ on PC Right-Click) directly on form below which will give a dropdown menu, select "view image" or "open image in new window” and send to printer. Watch the Mets take on the Giants in this traditional rivalry. You might want to get there early and hit the concession stands before the game, food and parking are not included in the cost. Carpooling is advised and let us know if you are available to drive or would like a ride. Attached is a link to a .pdf form which should be printed (black and white is fine), filled out and submitted, along with your check made out to The Old Guard of Westchester, on or before April 30, 2019. The Yankees host the Cleveland Indians in what may be an important game for both teams. Cleveland has been the American League Central Division Champions for the past three seasons, while the Yankees are attempting to rise to the top spot in the AL East. Doors open at approximately 6:00 PM hit the concession stands and grab a bite before the game, food and parking are not included in the cost. Carpooling is advised and let us know if you are available to drive or would like a ride. 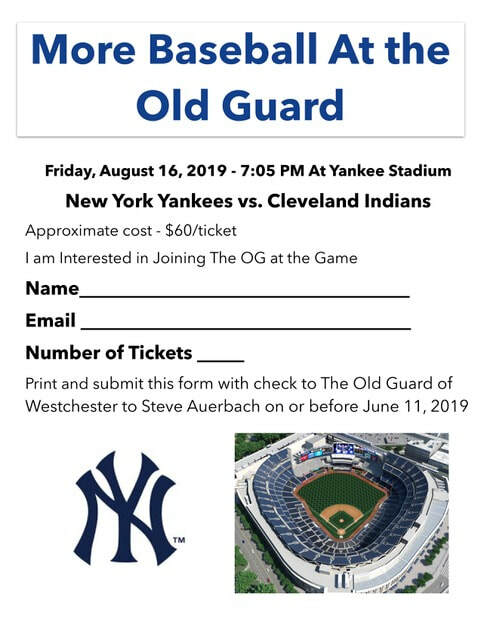 Attached is a link to a .pdf form which should be printed (black and white is fine), filled out and submitted, along with your check made out to The Old Guard of Westchester, on or before June 11, 2019.